Kandao Obsidian R. (c) 360 Rumors. 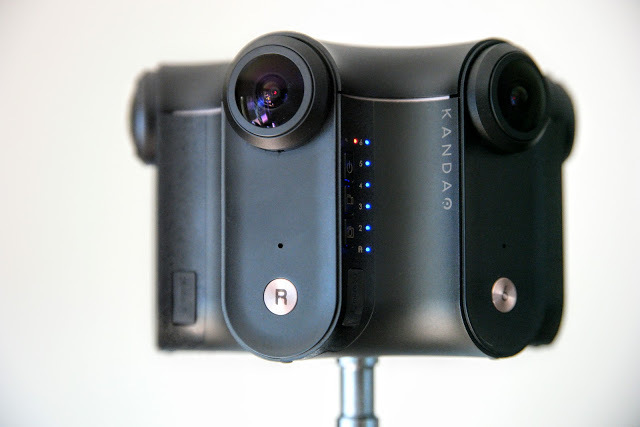 Over the weekend, I’ve been testing the powerful Kandao Obsidian R, a professional 3D 360 camera with 8K 3D 360 resolution and live streaming capability (no I don’t own it – yet 😉 – it’s just a loaner). Here are my first impressions and a tutorial for using it. 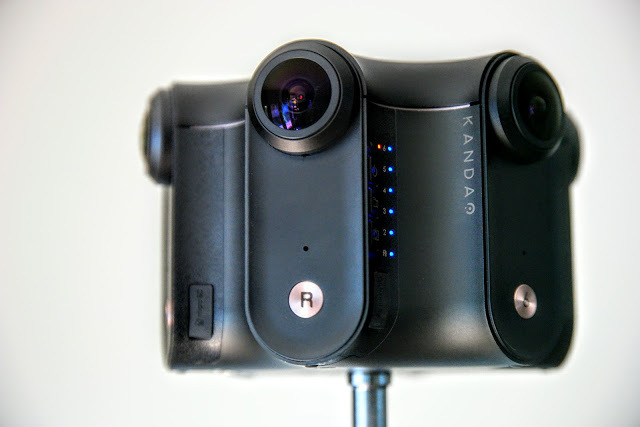 This year, Kandao launched three professional 3D 360 cameras: the affordable Obsidian GO (4K 3D 360 video, $2,499), the high-speed Obsidian S (6K 3D 360 up to 50fps or 4K 3D at 120fps; $6,999) and the high-resolution Obsidian R with 8K 3D 360 ($6,999). 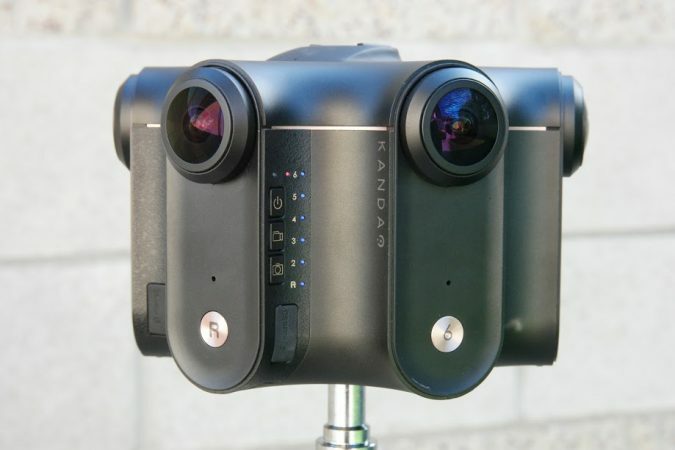 Kandao cameras and stitching software feature cutting edge 360 video technologies such as depth-aware stitching, Kandao is working on generating a depth map and even video with 6 degrees of freedom. 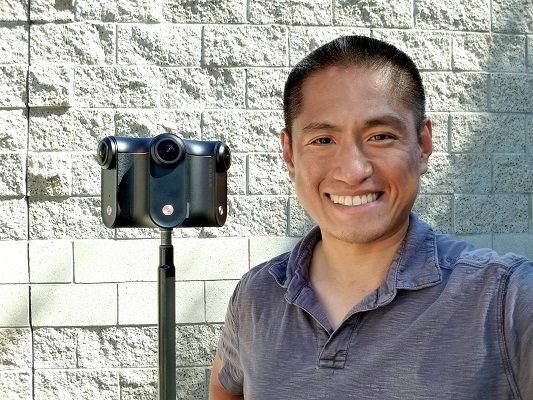 Obsidian R is AFAIK the most affordable 8K 3D 360 camera on the market (by comparison, the Yi Halo with 8K 3D 360 is about $15,000, and the Z Cam V1 Pro with 7K 3D 360 is $40,000). 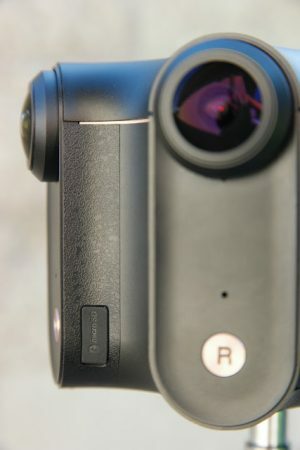 The Obsidian is sometimes compared with the Insta360 Pro, which can shoot 8K in 2D or 6K in 3D. Obsidian’s proponents point, among other things, to its advanced stitching technology and its high image quality. Originally, it was announced to be $10,000, which is beyond most photographers’ budgets, but the final price was set at $6,999, which put it just within reach of many professionals. Kandao sent me a loaner Obsidian R for testing for a couple of weeks. The Obsidian came in an aluminum hardcase with custom foam cutouts. The package does not include a battery. However, it uses two Canon LPE6 batteries for Canon DSLRs that many professionals already have. 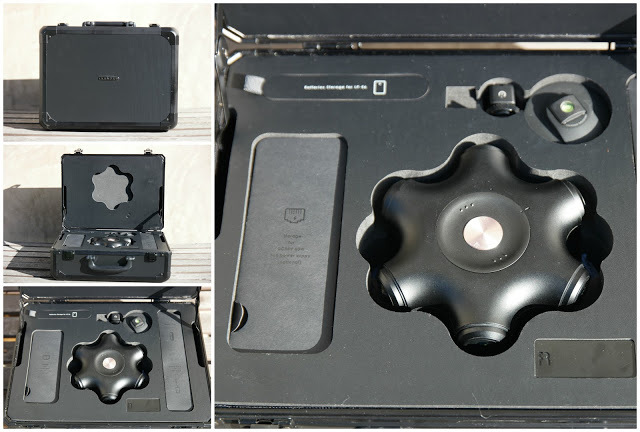 The Obsidian is smaller than I expected, although actually it is almost the same diameter as the Insta360 Pro, which is not unexpected because they both have six lenses and the interpupillary distances are about 63.5 mm, the same as the average distance for people in order to make the 3D effect appear natural. The Obsidian R’s body is polycarbonate with copper trim, and feels very solidly built, reminding me of the build quality of the Nikon D3 that I used to have. There is a small copper plate below each lens identifying the lens number. The Obsidian S is similar except that instead of copper trim, it has a striking red trim, and the lens plates are black. The Obsidian uses six Micro SD cards, which are stored below each lens, secured by rubber covers. 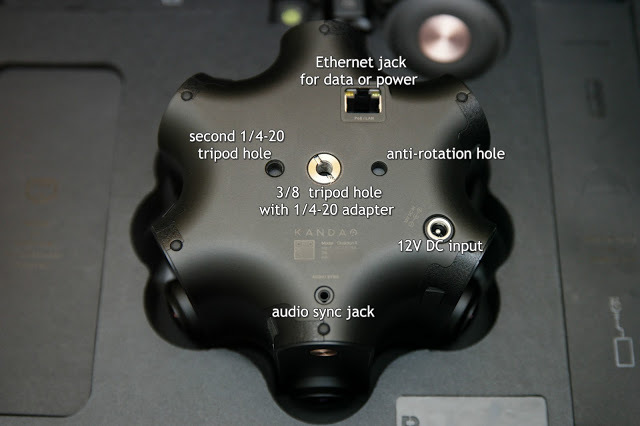 The bottom of the Obsidian has several connectors: the Ethernet jack for data or power, a 12V DC adapter input jack, an audio sync jack, and two tripod holes with a third hole for the anti rotation pin on some tripods. – use two Canon LPE6 batteries. For Power Over Ethernet, there is an optional POE power supply that looks like an AC adapter except that it has two ethernet jacks instead of a standard AC adapter cable. Like a standard AC adapter, it has a power plug. Then one ethernet jack goes to your network, while the other jack connects to the Obsidian, providing it with both data and power. For Canon batteries, the battery compartment is on top of the camera, making it easy to access even when the Obsidian is mounted on a stand. The battery compartment cover is easy to remove thanks to a couple of small springs that raise the cover slightly when unlocked. There are small spring-loaded clips to hold the batteries in place. When you push the clip away, there’s another spring to make it easier to remove the battery. Interestingly, there is a second battery compartment cover included that has a cold shoe on top. There is an included hotshoe to 1/4-20 adapter designed to make it easy to mount a Zoom H2N securely over the Obsidian without being seen in the shot. The cold shoe is a unique and very useful feature, and can also be used to attach the included bubble level or perhaps an LED light. The Obsidian can be attached to a tripod or light stand with 1/4-20 or 3/8 stud. After holding down the power button, the Obsidian starts up relatively quickly in about 10 seconds (that already includes the time you hold down the power button). – desktop control (for live streaming). On-camera buttons: to record a video, you can simply press the video button. It starts recording after a couple of seconds. Press it again to stop recording. The photo button works for both time lapses and for self-timer photos. To take a photo, you press the button. After a couple of seconds, it takes the first photo. It will then keep taking additional photos every 10 seconds (this interval can be adjusted in the remote app – see below). To stop shooting, you press the button again. Wi-Fi: the Obsidian can be controlled remotely via Wi-Fi but it doesn’t have a built-in Wi-Fi antenna. Instead, you need to connect it via the Ethernet cable to a wireless router (I used a Huawei HiLink router powered by a portable powerbank). Download the Obsidian app (Android or iOS), and connect your smartphone Wi-Fi to the wireless router’s network. Launch the app and tap “Connect.” In my case, it worked every time. You will see a live preview of each individual lens. You can switch shooting modes from photo, video, to time lapse. – auto, manual, ISO priority, Shutter priority. ISO range is 100 to 3200. Shutter speed 1/6400 up to 60 secs in manual mode. – exposure synchronization (whether to use the same exposure for all cameras). This is the sun icon at the top. – white balance synchronization (whether to use the same white balance for all cameras). This is the half moon icon at the top. Bluetooth: The Obsidian can be controlled wirelessly via Bluetooth, and it won’t require an external router. It works just like Wi-Fi except that there’s no live preview. To use this option, both the firmware and app must be updated. Simply turn on the Obsidian, launch the app on your phone, and select “connect with Bluetooth.” It will show the nearby Obsidians, and you tap on the one you want to connect with. Within a few seconds, it will show you the main shooting screen, the same one as for Wi-Fi except that there is no preview shown. Desktop control: You can control the Obsidian through the Kandao Studio app for Windows. To use this option, the PC and the Obsidian both have to be connected to the same router. Kandao Obsidian includes Kandao Studio, their stitching software for Windows (no Mac version available), which is very easy to use but does require a powerful computer. The requirements depend on your desired resolution and whether you are using fast stitching or high quality stitching, and can be as low as 8GB RAM and 2GB GPU memory (for 1920 x 1920 video with fast stitching) to 24GB RAM and 10GB GPU memory (7680 x 7680 with fast stitching and GPU accelerated stitching). For high quality stitching, you’ll need 24GB RAM and a graphics card with 8GB memory, such as a GTX 1080. There are several ways to transfer the files from the camera to the PC. The easiest way is to connect an Ethernet cable from the Obsidian to the router used by your PC. 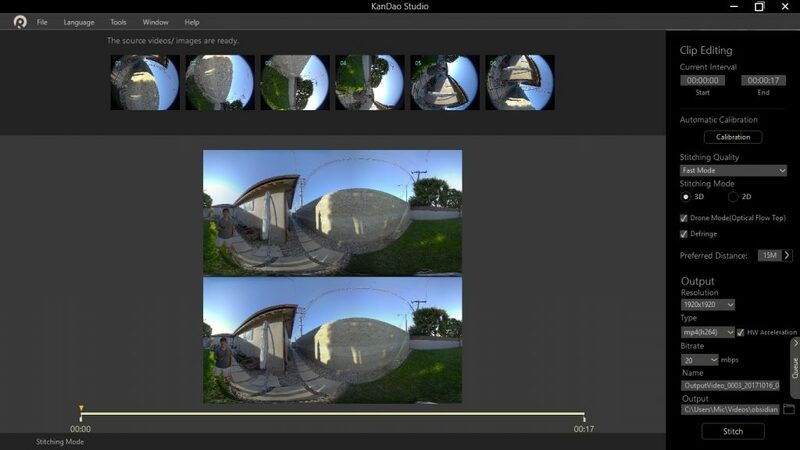 You then launch the Kandao Studio app, and go to Tools… Export to Camera, which will allow the Studio to copy the files from the camera to your hard drive. As long as you don’t rename the files, they won’t get mixed up. Studio will recognize related photos or videos and will only show you the primary name of the file and not the six files for each photo or video. But if you choose to use a 3rd party stitcher it helps to know the file naming convention. The file names for the photos and videos start out with a prefix 001, 002, etc. and the individual lens files for the same photo or video have the same prefix. The suffix is 01 o 06 to help you identify which lens the file came from. Stitching with Kandao Studio is as easy as it gets. You only have simple buttons, sliders, and checkboxes on the right side. It can be literally a one-click process. There is no need to identify control points or make manual adjustments. The interface for photos and videos are almost is the same, except that for videos, you have the option to trim the video by setting the in and out points. The easy interface means that you’ll be able to focus on the creative aspect of creating videos instead of being stuck with tedious stitching. I don’t have samples worthy of sharing yet but I will be shooting with the Obsidian over the weekend and will provide samples next week, together with a video tutorial and review. If you have particular questions, please let me know in the comments. How about audio? Does it record audio at all? Hi Petri. It can sync to a Zoom H2N recorder for 360 sound. Yes it has in-cam recording. Each of the six cameras has audio. 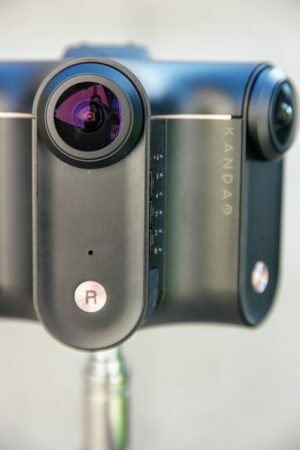 You mentioned “Kandao cameras and stitching software feature cutting edge 360 video technologies such as depth-aware stitching, Kandao is working on generating a depth map and even video with 6 degrees of freedom.” Do you think this means it’ll be able to generate 3D models like the Matterport? Do you know what resolution photos it can shoot at? Thanks for the first impression post. Hi Ryan. The short answer is, “not really.” The depth map is pretty basic, not sufficiently detailed for a 3D model. Where it could be useful is for creating effects such as text flying in between people at different depths. Obsidian R and Obsidian Go shoot photos at 8K 3D or 2D, while Obsidian S shoots photos at 6K 3D. I want to watch the difference Insta 360 Pro and Obsidian. Hi Masato. Yes I will compare. how did it went with test recording, curious to know about how the 8k 3D looks compared to Ozo or insta360 pro. Hi Joao I just got back my footage but now I’m waiting for my new PC to stitch it at full 8K 3D resolution. I’ll try to post samples with Mistika for now (Mistika doesn’t need i7, 24GB ram, GTX 1080). cool. what’s your experience with mistika VR? no more reviews on the Obsidian R? Hi Hugo. Yes I still plan to review it. Just going to take longer because I have to put together a new computer that’s powerful enough to stitch Obsidian at full resolution (needs i7 with 24GB ram and GTX 1080). I already have the new pc and graphics card and new psu. just need to put them together. Awesome Mic, looking forward to reading some more. Question .. What media are you using with the Obsidian R? Are you using SanDisk Extreme 128? 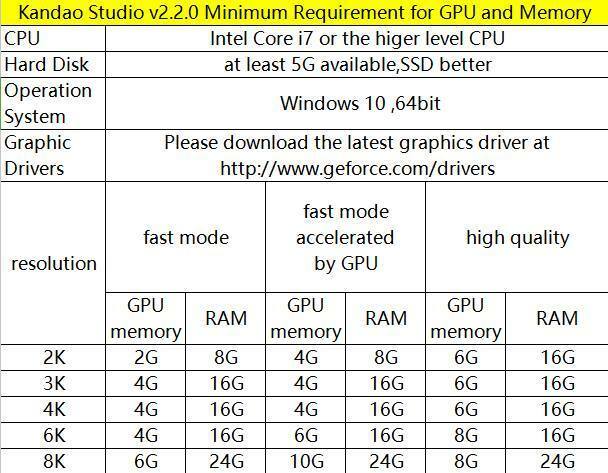 Just curious .. Also .. What kind of duration for say 64gig cards at 8K are you seeing? Hi, I’m using Obsidian R and the Issue with my camera is that the data for one lens is missing after capturing. while exporting files from camera it can’t download some files and gives error and after completion you can’t have all the data from 6 lenses here the data from one lens is missing. It happened to me several time and i was not able to deliver the project because it was not possible to cover that missing part with other lanses data or you can’t export a perfect file with 5 lens data. its random, some times it the lens 5 and sometimes its one of other lenses. *Please take a look at this scenario its very urgent and necessary for me.